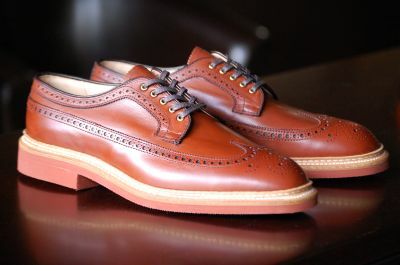 The term, brogue, is a word that can describe many many styles of shoe within the shoe realm. It is because of this that it is commonly misused and due to this misconception, I wanted to dedicate an entire post on brogues and what they really are. First off, let me start by saying that a brogue can be used to describe any shoe that has perforations in it (little holes). Because it ranges in such depth, you might find that the term can sometimes be confusing and attributed incorrectly. Therefore, let us begin the brogue education. 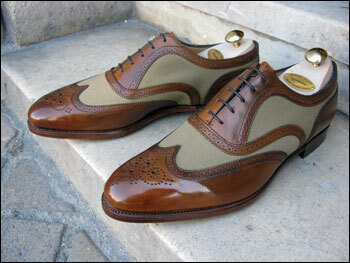 The word brogue was first heard and used by the Scottish and the Irish in the late 16th century. But it was not until later that it became something that was used to describe shoes. As you may think of it now, a brogue in it’s original use, also had holes in it, but they were actually functional, being that they used to drain the water that would get in a person’s shoes, from walking across a wet terrain. Up until the early 1900’s they were still considered a very casual shoe. It was not until later that they became what they are today: a super-hip dress shoe! 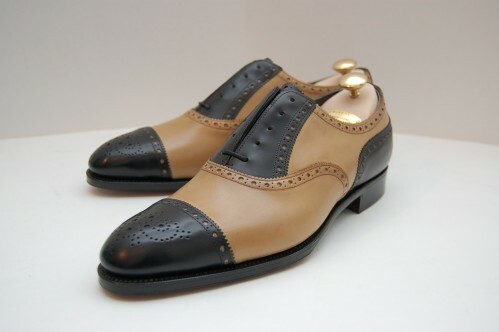 Full brogues, as shown above and directly below, are categorized by several things. First and foremost, they must have a wing-cap toe. Without this, it is not a full brogue, it will be called something else, of which I will get to below. The second thing is that you will find that full brogues will have each of the 5 pieces to the upper: cap, vamp, facing, quarter and counter (in case this is your first time reading, I described all of these here). It will always be the shoe with the most amount of perforations. 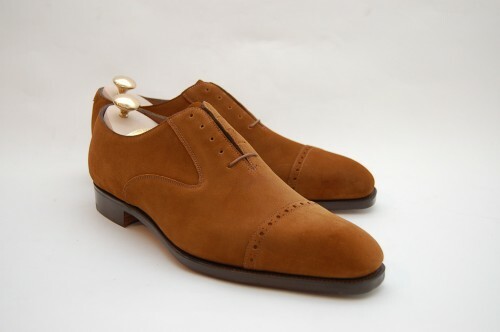 Now, there are several shoes that may look like a full-brogue but will not be, because they won’t have these 5 pieces, such as the Brummell shoe by Edward Green. 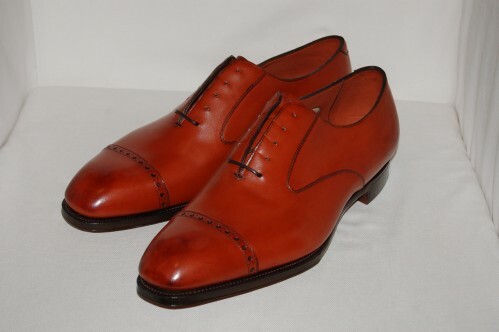 While I find this shoe much more appealing than a full-brogue, it sadly is not considered one, as it does not consist of all of the necessary components to make it so. Full brogues, however, are in my opinion the most well rounded shoes in dress shoe history, as they can look good with everything, from suits to jeans. This is obviously subjective, but can easily be proven by putting together the proper outfits. Now this can be up for debate, but I was always under the impression that a full brogue needed to be an oxford and not a derby, which would therefore categorize the picture below the 2 directly under this writing to be a semi brogue. However, this I am not 100% sure about. Semi brogues are the full brogues cousin. 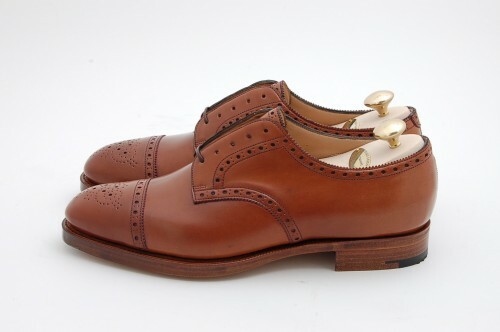 They can look exactly like a full brogue except that they will have a cap toe (as opposed to a wing cap) and also have a medallion (decorative perforations) on the toe. 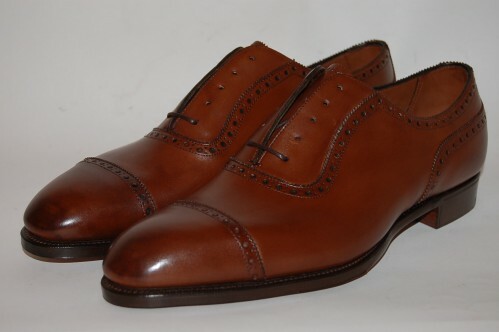 This is a very common shoe in the business industry as a cap toe generally denotes a business setting. Obviously though, you won’t find too many spectators, such as the one above, in the corporate environment. On that note, you will notice that a spectator, which is a style of shoe, can also fall under the brogue category as well as something else, like just calling it a cap-toe or a wingtip. All of these style names, as you can see, can sometimes be interrelated. As you can somewhat see, the lesser down we go, the less perforations you will find in the shoe, and the more dressier the shoe will be. 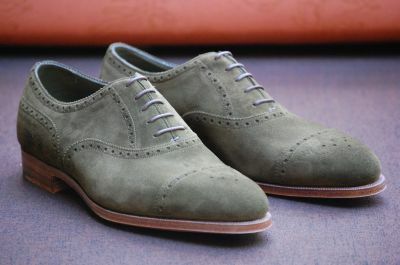 Quarter brogues seem to be far less common, at least from what I notice, especially in comparison to the full-brogue, which are among the most common of shoe styles. Quarter brogues are certainly not among the most stylish, when it comes to design, and maybe therefore this is the reason why I don’t notice them as much. They dwell in appreciation of being simplistic and are therefore used as a conservative shoe for conservative occasions, such as working in the financial district. 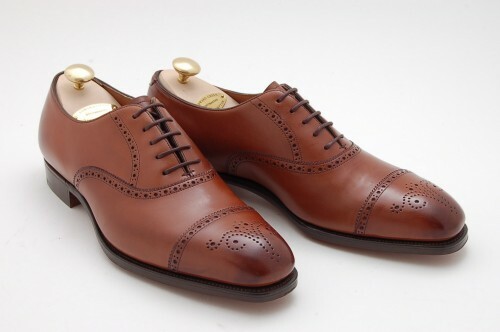 You will find that the majority of quarter brogues are going to have a cap toe. 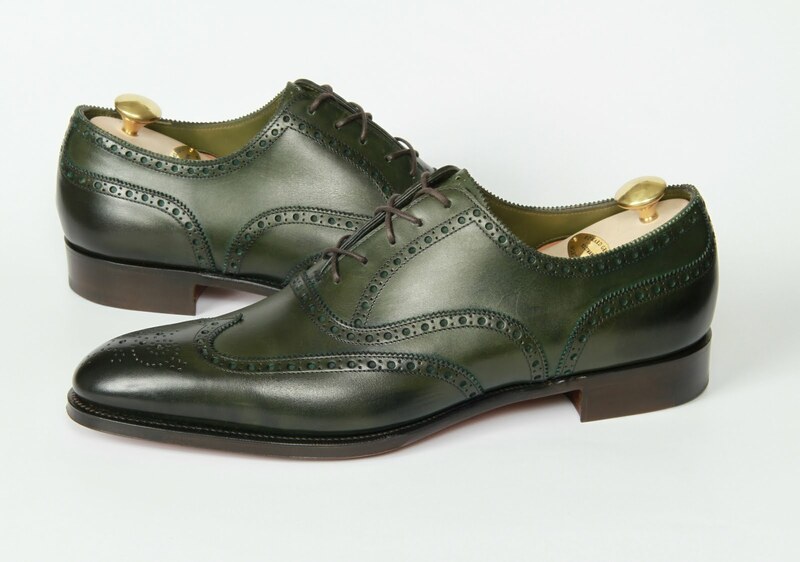 It will be uncommon for you to find a wing tip quarter brogue, as most designers seemed to be inclined to add all of the other pieces to the vamp when designing a wing cap shoe. But this is just my theory, let me grab my pen and paper and see how it actually looks! You will also notice that it must have not have a medallion on the toe, or else it becomes a semi brogue. 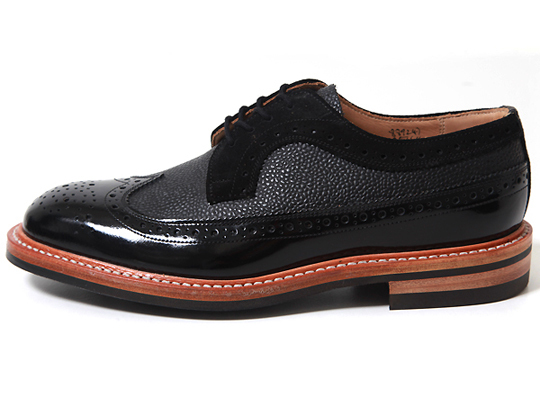 Ahh, the longwing brogue. This is the shoe most loved by Americans and American shoe companies. 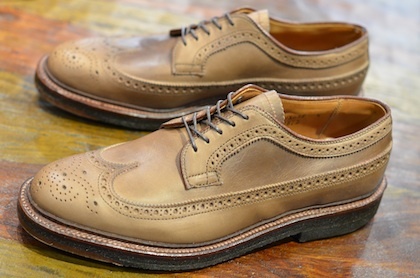 I was actually going to try and fill this entire post up with Edward Green’s but just realized that of course, they don’t a make a longwing brogue, at least not that I have ever seen. That being, I must give it up to the longwing master, Alden, as pictured below. The longwing derives it’s name from the fact that the wing cap, instead of ending at the joints of the foot, extend all the way back to the heel, creating a long-wing-cap AKA longwing. 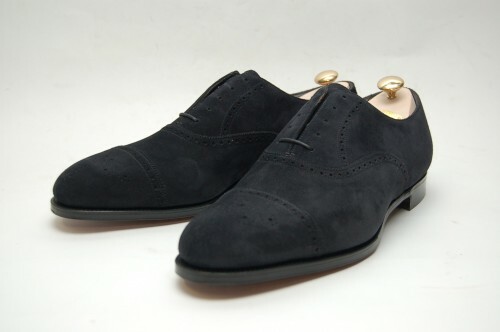 You really don’t see this shoe made too much outside of American shoe companies, with the exception of maybe trickers. I don’t know why really? Maybe because they are generally made in a bulky fashion, but I must say that they can look good with a nice pair of jeans. While there are many other shoes that have perforations on them, such as a monk brogue, it is pretty easy to understand what they might be labeled, or in actuality the fact that they might simply just fall under the casual title of ‘brogue,’ and truly not have a proper style name. Well, it’s been a long one and I need to go and enjoy what’s left of the sun, so until next time, enjoy the post! 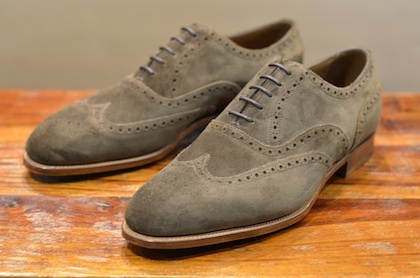 I’ve always loved suede brogues, as the designs add plenty of tasteful flavor to an otherwise muted material without affecting its handsome and homely nature. This inspired me to wear my shell cordovan longwings today! Speedmaster – Nice! Glad to have helped make your daily outfit easier to pick! Under the quarter brogues, which is the shoe on the top right? And also could that shoe be available in the same shape with full brogue? Dantaeos – Those shoes are by Edward Green. 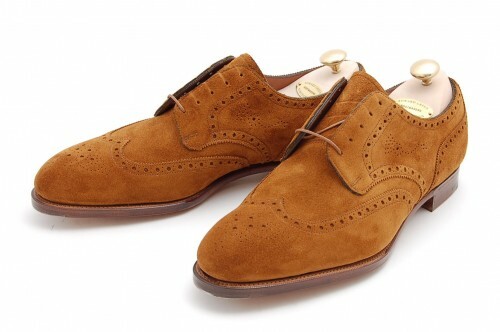 If you made them into a full brogue, it would change the design of them….and would look different.